AUDNZD Stalling Ahead of 1.0900? AUDNZD put in quite a run over the past week gaining nearly 200 pips during that time. The rally has been driven by dovish RBNZ stance which suggested that it may actually lower rates in the near future. Meanwhile, the RBA remains resolutely neutral and the eco data has been steady, indicating that after nearly two years of inaction the central bank may want to reconsider its posture. Tonight’s AU employment data could provide a strong clue to the strength of AU economy. If labor conditions continue to tighten further the gap between AU and NZ yields on the long part of the curve will widen out further and the pair could push towards the key 110.00 barrier. However, if the numbers miss, so rebalancing is due and the pair could retrace back to 108.00 by end of the week. The U.S. dollar is trading lower against all of the major currencies this morning while the Japanese Yen and Swiss Franc are trading higher across the board. Asian and European equities followed U.S. stocks lowered with Dow futures now pointing to another day of weakness for U.S. stocks. President Trump’s tariffs have elicited an antagonistic response from China who said they could take measures to protect their own interests. Canada has also blasted this move while the European Commission says they have counter-measures ready against U.S. tariffs and will discuss a response on Monday March 5. We can’t imagine all of this going well and the risk of retaliation will continue to weigh on market sentiment. We expect further weakness for the yen crosses and think EUR will be vulnerable to profit taking ahead of this weekend’s political events. Prime Minister May will be speaking shortly and we doubt that the market will be satisfied or sold on her plans for Brexit. The Canadian dollar extended its losses ahead of its monthly and quarterly GDP reports. The New Zealand dollar is underperforming the Australian dollar and we believe that is likely to continue. We’re late with this note (all trades were posted on slack) because we were preparing to live trade the Bank of England rate decision but now that the first leg of movement has occurred -- we have a few minutes to share our thoughts. The U.S. dollar is trading higher against all of the major currencies this morning (with the exception of GBP which popped on the BoE’s upgraded growth forecast and their comment that rates could rise faster and earlier than they anticipated in November -- which is an overwhelmingly positive comment. Stock futures are pointing to a lower open but the decline so far appears modest so USD/JPY is attempting to bottom and we think other yen crosses will as well (which is why we are long EURJPY). USD/CAD is also meeting resistance and we have chosen to buy the Canadian dollar vs. the Swiss Franc although USDCAD itself looks like an attractive sell. AUD and NZD are weak and likely to fall further but AUD is deep in its decline whereas NZD is just beginning to catch up, making AUD/NZD an attractive long trade. EUR is neither here nor there. Its benefitting from GBP strength but also held back by USD gains. Unlike the past few days, we’re actually seeing some volatility in the FX market this morning. The U.S. dollar is trading sharply lower across the board with decent losses (for a holiday) against the Yen and euro. There is absolutely no particular reason for this move outside of the greenback extending lower in a week marked by losses and high beta currencies powering higher on the back of equity market gains. However with U.S. yields up sharply this morning, we could see the greenback recover in the hours to follow. EUR/USD is now firmly above 1.19 but there’s major resistance near 1.1960. USD/JPY has support at 112.50 and GBP/USD has resistance right above 1.3350. USD/CAD should find support at the 100-day SMA near 1.2600 while AUD and NZD are poised for a pullback. It should be no surprise that today is a subdued day in the FX markets. Monday is Christmas, Tuesday is Boxing day and many European traders have already left early to spend the long weekend with their families. There are a flurry of U.S. economic reports due for release this morning but it should also be a quiet day in North America with limited participation. The dollar retains its bid after the Congress approved the bill to fund the government through January, avoiding a shutdown. In Spain, the Separatist parties won a majority in the election which is a problem for the national government as it has empowered the region’s ousted separatist leader to call for new talks. GDP numbers are due for release from Canada and they are likely to be firmer, helping loonie retain its gains. AUD is strong while NZD is weak. GBP is stuck in a 30 pip range near 1.34. 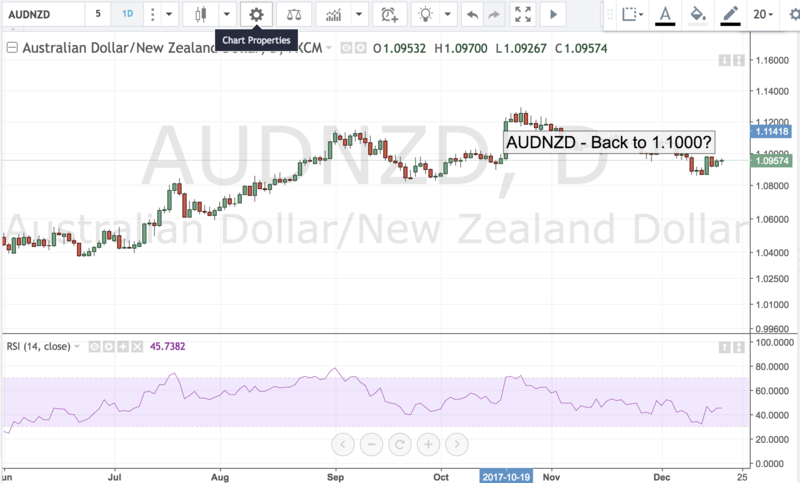 AUDNZD – Back to 1.1000? New Zealand Dairy Auction was a disaster today. Price dropped by their biggest amount in a year as the rate declined by -3.9%. Overall in the past half year price have fallen in 4 out of the past 5 months and that does not bode well for the kiwi economy as milk is the country’s primary export. The NZDUSD slid below the 7000 figure, but we believe the fall cab steepen substantially over the next few days as New Zeland reports Trade Balance and GDP figures. If the data disappoints then kiwi could slide below .6900 and that is likely to push AUD/NZD above the 1.1000 level. AUD/NZD has found solid support above the 1.0850 level and now looks ready to take off above the 1.1000 figure to challenge the highs from the start of the month. There is very little consistency in the performance of the U.S. dollar this morning but US yields are up across the board. 10 year Treasuries are knocking on the 2.4% door but similarly large moves in 10 year UK Gilt and German Bund yields have prevented EUR and GBP from experiencing any meaningful losses. Eurozone PMIs were mixed, adding to the concerns that the ECB may offer a dovish taper on Thursday. The Canadian dollar is trading slightly lower ahead of tomorrow’s rate decision. The big moves all came overnight when NZD plunged on the back of the new government’s agenda. USD/JPY also staged a dramatic recovery after crashing down to113.25 during the Asian trading session on very little news. Looking ahead, the US’ Markit PMI reports are scheduled for release today but investors will be focused on the move in yields and any updates on President Trumps’ Fed pick. He’s said he will make a decision very very soon -- the debate for many is that it will be Powell vs. Taylor or a combo of both. The U.S. dollar is trading sharply higher this morning after the US Senate approved the tax reform resolution last night preventing a filibuster from the Democrats. The next stop is the house. Investors are extremely excited that tax cuts are on the way and have celebrated by taking the dollar, stock futures and bond yields sharply higher. The JPY, CHF AUD and NZD have taken the brunt of the selling but EUR is also down slightly. Sterling on the other hand recovered overnight losses and is trading higher against the greenback on the hope for a rate hike next month. Investors were also encouraged by comments from Germany’s Merkel who suggested that sufficient progress will be made to take talks to their next step. With Canadian CPI and Retail sales due at 8:30am NY, the CAD is trading in a narrow range. We believe further USD gains are likely in the North American session as U.S. traders cheer the news. Most of the major currency pairs are trading sharply lower this morning with the losses led by AUD/USD and USD/JPY. Softer Australian data last night sent AUD tumbling and puts the currency at risk of a steeper decline to 78 cents. Sterling on the other hand is being hit by comments from Prime Minister May who proposed cap household energy prices and more social housing. The dollar is also weak with USD/JPY losing ground quickly on the back of falling yields and this is pushing all of the Yen crosses lower. North American traders will have their eyes on Canada and the U.S.’ trade balance reports along with speeches from Fed Presidents Powell, Williams and Harker (all by 10am NY). It may be a quiet morning in the foreign exchange market but the weakness we saw in the dollar last week carried over this morning as the greenback is trading lower against all of the major currencies this morning. The market is still disappointment with Yellen and pleased with Draghi. However with Donald Trump focused on dealing with Hurricane Harvey, the lack of a reaction to North Korea’s launch of 3 short range ballistic missiles into the Japanese sea helped USD/JPY avoid immediate losses at the Asia open. Harvey has caused significant damage in the region and while it is now a Tropical Storm, more rain could lead to more flooding in the coming days. While oil prices are lower this morning, gas prices hit 2 year highs. There should be some catch in oil today. The euro remains one of the best performing currencies although AUD is also seeing quite a bit of demand as oil and copper prices tick higher. After hitting a high of 1.2945, the reversal in GBP/USD reflects the pair’s overall weakness and suggests that we could see further GBP underperformance vs. EUR and possibly even the commodity currencies. We have a busy day ahead of us for the Canadian dollar and the U.S. dollar. The morning starts with the Bank of Canada rate decision and that will be followed by the FOMC minutes in the afternoon. The greenback is trading with a slight bid and the same is true for the Canadian dollar. GBP made a run for 1.30 again last night, backed off that level and is still struggling to figure out which way it wants to break (we think the break will be to the downside). The best performing currency this morning is the New Zealand dollar which is benefitting from last night’s strong trade balance and anti-AUD flows which is driven by Moody’s downgrade of Chinese debt. We think NZD will outperform and USD will stay bid ahead of the Fed minutes, which is why we are +USDCHF and +NZDCHF.